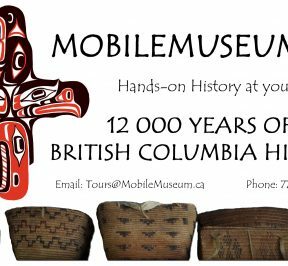 The BC Artifacts Mobile Museum Tour is an authentic and engaging program presented by Tony Hardie, descendant of the Secwepemc (Shuswap) people, of the Central Interior and pioneers of British Columbia. The BC Artifacts Mobile Museum Tour travels to BC public and private schools, community events, and private parties throughout the lower mainland and other parts of British Columbia. Three main areas of BC History are included in the displays and presentation, including First Nations, as well as Pioneer, Gold Rush, and Fur Trade era artifacts. Great resource for all ages! Book your tour date(s) today!